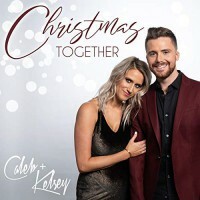 AN EIGHT-song mini-album by Nashville-based husband and wife duo Caleb + Kelsey features Christmas evergreens like "O Holy Night", Silent Night", White Christmas" and an original song "Don't Save It All for Christmas Day". 'Christmas Together' is issued on Rhodes Records, distributed by The Fuel Music. Cory Ashbury's "Reckless Love" mashed up by Caleb + Kelsey. Husband and wife duo Caleb + Kelsey release "Bless The Broken Road"